When Colin Kaepernick throws his first touchdown pass in the 2014 season, the star San Francisco 49er quarterback will be playing in what one Twitter user dubbed it as "the field of jeans." That's right. Field of Jeans. In a joint news conference on Tuesday, the CEO of Levi Strauss and the 49ers announced that the new $1.2-billion football arena in Santa Clara will be called Levi's Stadium. 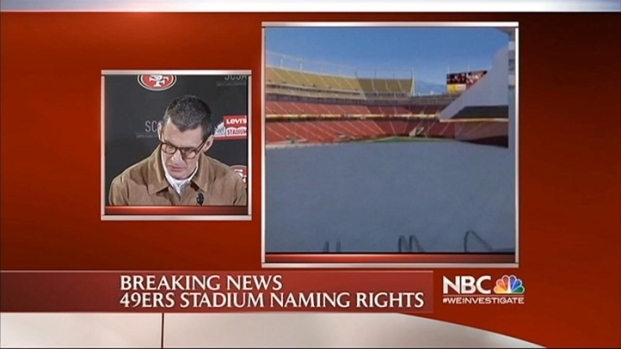 Levi's CEO Chip Bergh said that his San Francisco-based company will enter a 20-year, $220-million contract to buy the naming rights to the San Francisco 49ers new stadium in Santa Clara. Jed York has nothing but praise for the new partnership between Levi Strauss and the 49ers. Bergh called the merger a "great partnership" between "two iconic" institutions: Levi Strauss and the 49ers, noting that the denim company first made jeans for the Gold Rush 49ers who panned for gold in San Francisco. "This is a great day for the 49ers and for the Bay Area," added 49er CEO Jed York, who acknowledged that the new name - and influx of cash - comes just before the Super Bowl bid announcement, which Santa Clara is vying for. Before the announcement was made, many fans were offering up their suggestions on the new stadium name, including Denim Stadium and Skinny Jeans Stadium. Jokes about "button fly" touchdowns and "Section 501" needing a "zipper fly" abounded. 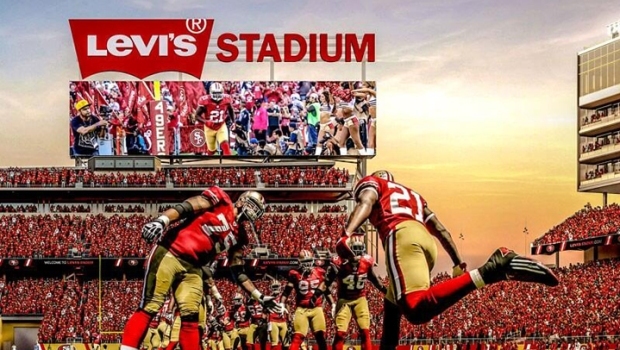 Levi Strauss & Co. CEO Chip Bergh said Levis Stadium will connect two iconic Bay Area brands that share similar values, a rich heritage and a pioneering spirit. But York, who is prolific on Twitter himself, said: "The best thing I've seen on Twitter was 'Welcome to the field of jeans.' "
San Francisco Mayor Ed Lee and Santa Clara Mayor Jamie Matthews were also in attendance at the news conference. Both said they were happy with the partnership. The NFL football team is leaving San Francisco's aging Candlestick Park stadium, for a modern, high-tech one in Santa Clara. Despite the move, the team will still bear the name the San Francisco 49ers. Matthews added that the $220 million is is a "large amount to pay down the stadium." "As powerful advocates for our communities, we share a vision for the new stadium constructed on the pillars of innovation, sustainability and an unparalleled entertainment experience," Matthews added. City councilwoman Teresa O'Neill, a past skeptic of financing the new stadium, agreed that for a naming rights deal, this is "excellent' and does help pay down the overall cost. However, O'Neill noted that under the agreement provided to the city council, Levi's will pay $154 million to the Stadium Authority. 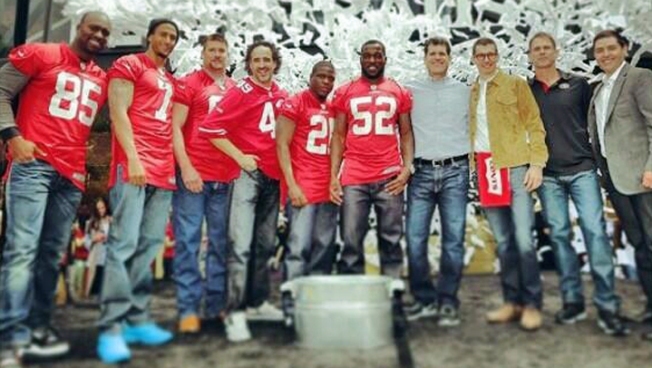 And in a separate contract, Levi's agreed to pay $66 million to the football team for sponsorship benefits. The Santa Clara stadium will not only be the new home to the San Francisco 49ers, but it will also serve as an outdoor sports and entertainment venue. It was designed by HNTB and is being built by Turner/Devcon in Milpitas, Calif.. The $1.2 billion venue will have 1.85 million square feet, seat approximately 68,500 and will feature an expected 165 luxury suites and 8,500 club seats. It was designed to be a multi-purpose facility with the flexibility to host a wide range of events, including domestic and international soccer, college football, motocross, concerts and various civic events, and will be expandable for major events such as the Super Bowl. For more information, go to www.newsantaclarastadium.com. NBC Bay Area's Lori Preuitt contributed to this article.